Religion had central importance in the Aztec Empire since it was not only closely linked with the expansion and power of the empire but also legitimised the rule of the kings. The priests performed various rituals and prayers during the religious festivals and ceremonies. 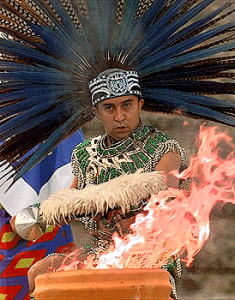 These ceremonies were performed at the end of the each Aztec month which consisted of twenty days. The most important aspect of these religious ceremonies performed by Aztec priests was the human sacrifices for which prisoners of war were used. Aztec priests traced the entire history of the world and creation in order to legitimise the Aztec empire and the ruling family. The world was created after constant infighting between different gods and it took five tries for the gods to finally create the agreed upon version of the world. These major gods were Tezcatlipoca, Nanauatl, Ehecatl, and Quetzalcoatl. The kings of the Aztec empire were considered the descendants of divine beings. The elaborate religious mythology existed among the Aztecs before the empire was established but it was refined by the Aztec priests after the formation of the empire. The Aztecs had a variety of different gods in their pantheon. These gods looked after a specific aspect of nature and creation. The Aztec priests were the guardians of the temples devoted to different gods and performed various rituals and prayers for the people. Sacred hymns were common feature of religious festivals. Important gods in the Aztec pantheon included Huitzilopochtli who was the patron god of the Mexica people and also the sun god, Tlaloc the god of rain and storm, Metztli the moon god, as well as various goddesses. Aztec priests enjoyed a very privileged status in Aztec society but they also had to live quite hard lives. Aztec priests enjoyed a very privileged status in Aztec society but they also had to live quite hard lives. Their daily lives included fasting and constant prayer in the ordinary days. In the days of war, which were frequent in Aztec society, the priests also accompanied warriors to the battleground in order to hear their confessions. Aztec society also had rich religious rituals and different feasts and ceremonies were held for different gods. Human sacrifices were important part of these religious rituals and ceremonies. Aztec priests had important roles in the Aztec society. In the Nahuatl language of the Aztecs, the priests were called tlamacazui which means giver. Priests enjoyed respect and privilege in society on par with the nobility, considering the central importance of religion. The main role of the priests was to oversee the offerings for the gods including human sacrifices. 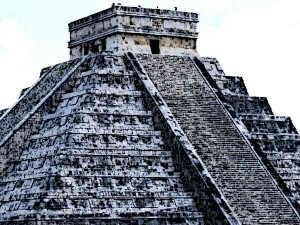 They also performed various rituals and prayers in the Aztec temples. Additionally, priests heard confessions which included the confessions of warriors on the battleground. Aztec religion had certain customs and rules that Aztec priests guarded. This included a specific method to become an Aztec priest and certain responsibilities of the priests. The Aztec priests who performed the sacrificial rites remained in very rough attire which added to their mystique. Priests also wore specific kind of costumes which was reserved for them. This included black or dark green robes that reached down to their feet. Aztec religion and thus priests had their own set of beliefs. According to these beliefs, the world consisted of three parts. One was the earth on which humans lived, the second the underworld where the dead went, and the third was called the upper plain in the sky which was not accessible to humans. Aztecs had many different gods who had powers over different aspects of nature. Aztecs also believed that the souls of fallen warriors and women who died during childbirth were transformed into hummingbirds that followed the sun through the sky. The special kind of clothing reserved for the Aztec priests was called xicolli. It consisted of a sleeveless jacket or a waistcoat and there were various openings in the jacket for accessories. The Aztec priests who were overlooked for the sacrificial rituals usually had a very rough attire. During the rituals and ceremonies, the priests would sometimes dress up as a specific kind of god. Similarly, different dressing was used for other occasions. Aztec Priests Religion Aztec Temples – Other than the specific living quarters, the priests also spent a lot of their time in Aztec Temples. Special living quarters were reserved for Aztec priests just like separate quarters for warriors and other classes of society. These quarters had houses made of stone, just like the houses of the warriors and the nobility. This was because the status of the Aztec priests was similar to that of the warriors and the nobility, even though the priests had more responsibilities. Other than the specific living quarters, the priests also spent a lot of their time in the temples. Since religion was of central importance in the Aztec society, the priests enjoyed considerable amount of power and privilege. They provided the religious festivals and norms that legitimised the rule of the emperor. Thus the emperor derived his power directly from the Aztec priests who were thought to be custodians of the religion that guaranteed the stability of the cosmic and political order. There were feasts like Huey Tocoztli where the emperor himself participated in the rituals, signifying the importance of the religious festivals. Religion was the binding glue of the Aztec empire and provided the ideological foundations of the rule of the emperor. Thus with this foremost importance of religion, the status of the Aztec priests in society also increased. Aztec priests headed the religious ceremonies and festivals which were very common in Aztec society. Although priests enjoyed privileges on par with the nobility, their lives were rather hard. Other than the usual rituals and ceremonies, Aztec priests also sometimes accompanied the warriors on the battleground in order to hear their confessions. Aztec priests had separate living quarters and used a unique dress code. The Aztecs worshipped different kinds of gods and during the ceremonies the priests also did impersonation of these gods. Priests in the Aztec society enjoyed a high status and were central to the unification of this military empire.